When analyzing your website using VWO research tools such as heatmaps, surveys, form analysis, recordings, or goals and funnel tracking, you may feel the need to make certain observations in the reports; for example, change in visitor behavior, increase or decrease in goal conversions, and other important details. These observations or learning you derive from the analysis help you build a more data-driven hypothesis for your next test. These help you discover the friction points, confusions, and distractions that prevent your visitors from converting. Using VWO, you can easily add observations from the Reports section. These observations are consolidated and displayed in the Observations dashboard under Plan. Select the observation you want to edit, delete, or link to a hypothesis. Click the View Snapshot link on each observation to go to the original report where the observation was made. ATTENTION The link to view the snapshot will be removed if you delete the linked report where the observation was added. Click the Add Observation icon (the eye icon) and then click Create an Observation appearing on the sidebar. For every observation you add, provide the following information on the Create Observation panel that displays on clicking Add Observation. Description: Enter the observation you made on the report. Please note that the maximum character limit for adding an observation is 200. Page URL: VWO automatically picks up the URL of the page where you are viewing the report. For goal observations, VWO tracks the conversion URL of the goal. Add Attachment: Upload any additional document or information you may want to attach for the observation. Add Label: Enter a label or tag for the observation you add. You can filter the observations using the labels defined. From the Detailed Report section of your Goal, click the Add Observation icon. The Observations panel appears. In the panel, click Create an Observation to type your observations and save these for future reference. VWO saves a snapshot of the report along with your description and the conversion URL defined for the goal. You can access the observation from the Observations dashboard under Plan. From the Detailed Report section of your Funnel, click Add Observation. The Observations panel appears. 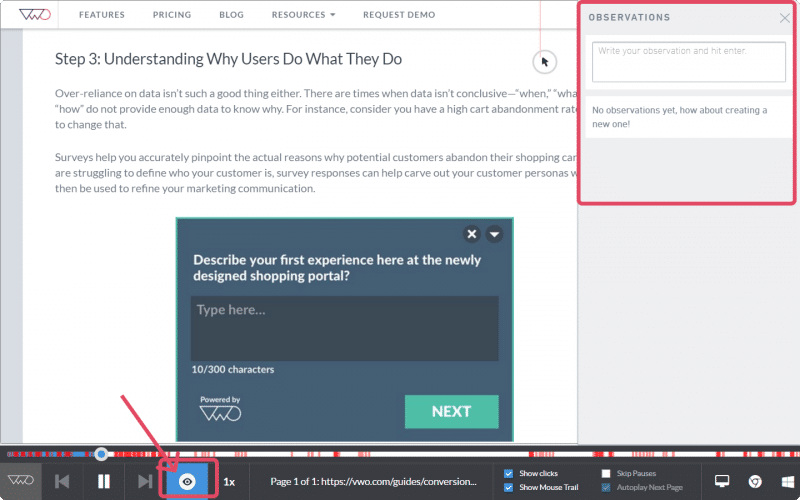 VWO saves a snapshot of the funnel report along with your description. You can access the observation from the Observations dashboard under Plan. ATTENTION To add an observation from your Heatmaps reports, you must first install the VWO plug-in for Heatmaps capture to your browser. Click here to download the plug-in. If you have already installed the plugin, then you may need to either update it manually from the extensions page or restart the browser. Select Heatmap under Analyze and then select the heatmap view you want to analyze. On the heatmap tool options, click the Add Observation icon. Select an area where you want to add the observation on the heatmap. 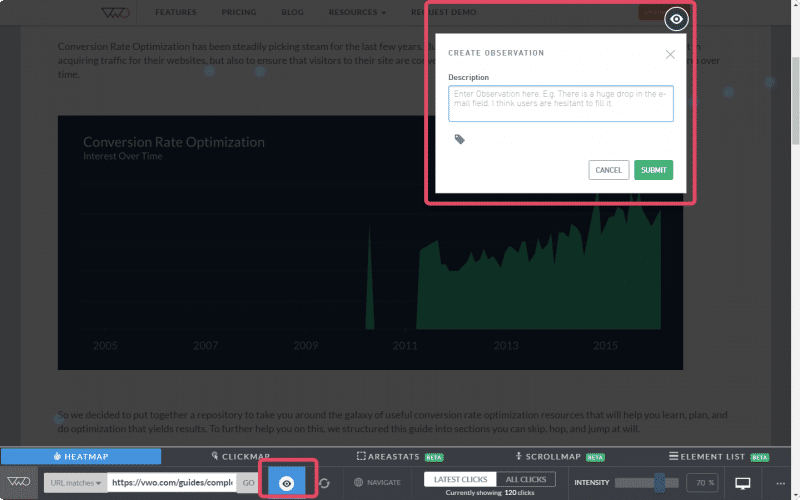 VWO saves a snapshot of the report along with your description and the URL on which you are viewing the heatmaps. You can access the observation from the Observations dashboard under Plan. Select Recordings under Analyze and then click the visitor recording you want to view. If you observe any important event captured in the recording, click the Add Observation icon on the recording player. In the Observations panel on the right side of the recording player, type the observation you want to add and then press Enter on the keyboard. VWO adds a part of this recording to the observation, starting from the moment you start typing the observation. VWO saves a snapshot of the report along with your description and the URL on which you are viewing the recording. You can access the observation from the Observations dashboard under Plan. From the Detailed Report section of your Form analysis, click the Add Observation icon. The Observations panel appears. VWO saves a snapshot of the forms report along with your observation and the URL of the form page. You can access the observation from the Observations dashboard under Plan. From Detailed Report of a form, under Respondent View, click Add Observation. You can create observations for individual responses. Under Question View, click Add Observation to create observations for survey questions. VWO saves a snapshot of the survey report along with your observation and also the URL of the survey page. You can access the observation from the Observations dashboard under Plan. Please email us at support@vwo.com to tell us what you were looking for. We'll send the answer to your inbox.